“Contacting the World” is a pioneering international theatre project that redefines how young people communicate with each other on a global scale. Since 2002, hundreds of young people have participated in making new, passionate, transforming theatre that reflects the world around them. Produced bi-annually by Contact in Manchester, “Contacting the World” has developed an inspirational approach to worldwide youth exchange. Every two years, twelve companies of young international theatre makers begin a creative journey of intercultural understanding and exploration, learning how theatre is made around the world and how different lives are lived. The culmination of this ten month long process is an eight day festival of public performances, creative workshops, street events, discussions and forums. 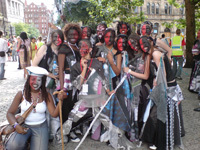 In July 2006 over 150 young theatre makers from The Philippines, Brazil, Rwanda, South Africa, India, New Zealand, London, Leicester, Liverpool, County Durham, Manchester and Scotland met in Manchester for Contacting the World 2006. 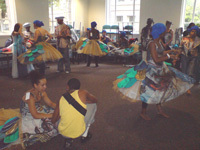 The project consisted of two main parts: a workshop concentrating on the different aspects of Carnival traditions from Trinidad and Brazil, and daily work with young people from one or more theatre groups from The Philippines, Brazil, Rwanda, South Africa, India, New Zealand, London, Leicester, Liverpool, County Durham, Manchester and Scotland. 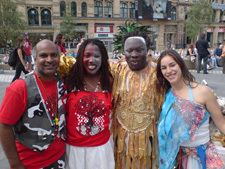 My role was to discuss some of the African influences in different carnival traditions found in Brazil; e.g. Samba Schools in Rio, Afro Blocs in Bahia and Maracatu Nations in Pernambuco. This was followed by a taster session where participants could enjoy some hands on experience playing a simple Samba Reggae. I also worked with a closed group of 15 young people primarily from Manchester and London, teaching them a groove preparing them for static performances and a parade. This was done in conjunction with a Brazilian dancer and choreographer who presented music and dance for the Goddess Oxum. Participants worked hard during rehearsals, concentration was excellent and they had a desire to present to the highest standard they possibly could. The finale (in costume) was truly wonderful and many people came to see and hear the drumming and dancing as we paraded down the streets of central Manchester. “The percussion aspect of the Street Event was delivered in an engaging and professional manner by Ravin Jayasuriya. Workshops were gauged appropriately and ranged from working with a core group of street performers and drummers to offering a taster session to a number of young people from different countries. 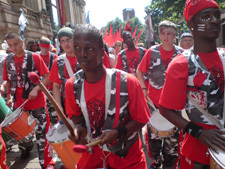 ”The Brazilian style drumming was a major aspect of the street event and the sound drew the crowds of Manchester closer to the array of the countries and colours featuring in the procession. “Workshops offered new learning for people who had massive amounts of experience and also for young people whose first time it was learning percussion.” Michelle Odogu, Street Co-ordinator, Contact in Manchester.